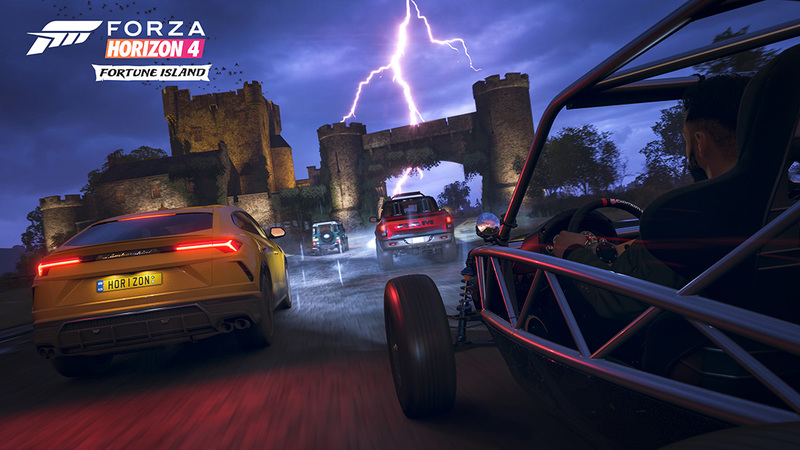 Treasure, adventure, and epic driving action awaits you on Fortune Island, the first expansion for the critically acclaimed open world racing game Forza Horizon 4, developed by Playground Games. 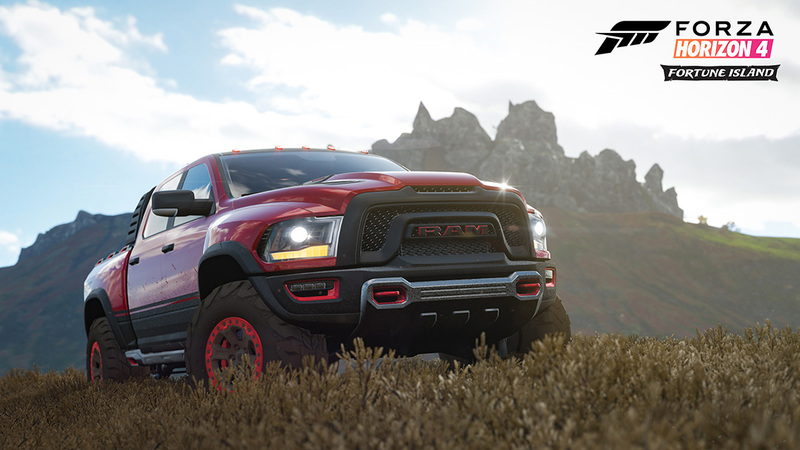 Fortune Island launches on December 13 for Xbox One and Windows 10 PC and is included for players who own the Forza Horizon 4 Ultimate Edition, Ultimate Add-Ons Bundle, or Expansion Bundle. 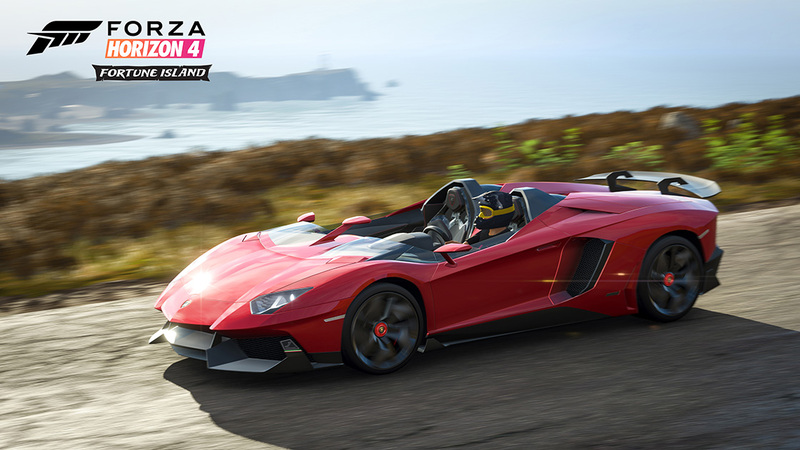 Travel to Fortune Island and experience the most treacherous expansion ever seen in the Forza Horizon series. 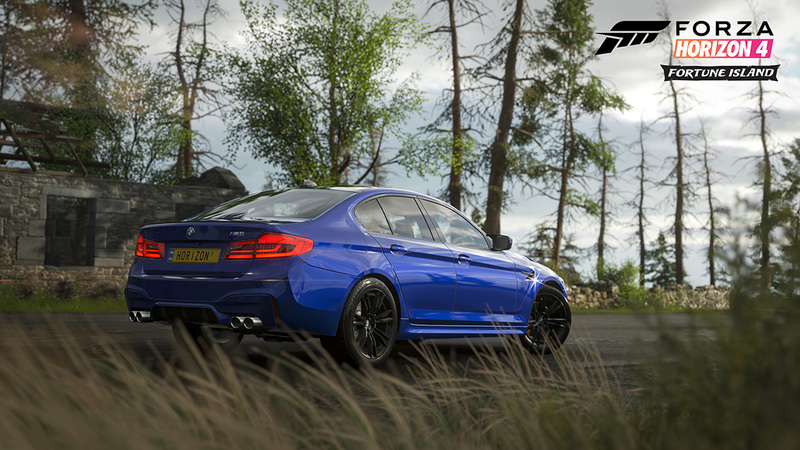 Fortune Island is full of extreme terrain just begging to be explored in the vehicle of your choice. Navigate the sheer cliffside roads of Laufey’s Throne at speeds that are only limited by your courage. Get slideways through a massive drift zone on the Needle Climb – the largest paved mountain switchback road in Forza Horizon history. 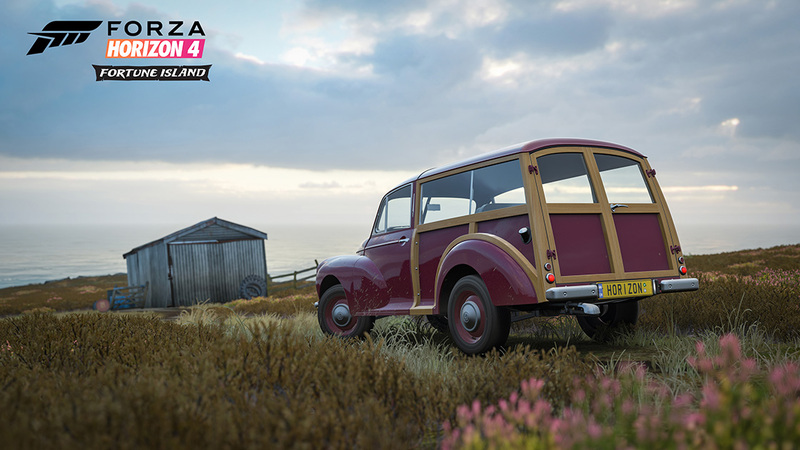 From the forests of Oldlarch Forest to the mysterious sunken village of Fenholm, Fortune Island rewards the curious and the brave alike. 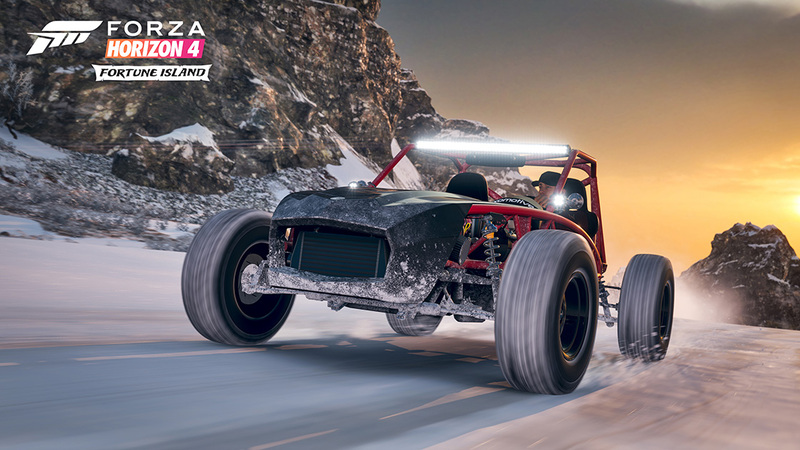 While the terrain of the island is dangerous enough – and ideal for the dozens of events Cross Country, Asphalt Races, Drift Zones, and more that you’ll encounter – the weather is just as perilous. 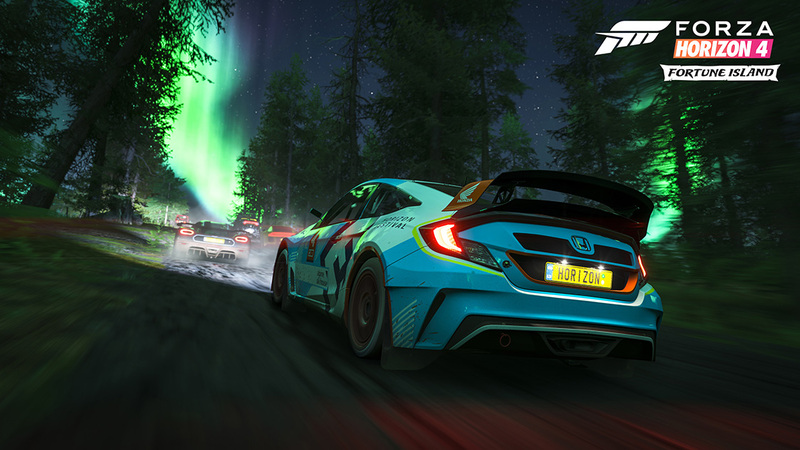 Moody, atmospheric storms, driving wind, lightning strikes, and the beauty of the Aurora Borealis all await as you chart a new location for the Horizon Festival. You’ll find new challenges and new events to take part in around practically corner. The “fortune” in Fortune Island is a very real thing. As soon as you arrive on the island, you’ll be immersed in a quest to search down treasure chests scattered across the expanse of the island. Solve the riddles and locate the treasure chests to add millions of credits to your bank account, as well as some amazing new vehicles. Along the way you’ll take part in dozens of new events, including the brand-new Trailblazer PR Stunts, where your goal will be to find the quickest route between two points. With huge elevation changes, and tricky terrain at every turn, Trailblazer events are a test of route planning, split-second reactions, and driving skill all at once. In addition, players can live a new Horizon Story: Drift Club 2.0. This isn’t your grandfather’s LM002. Whereas Lamborghini’s original “Lambo truck” was bulky and at home in the off-road, the Urus excels on pavement. Sure, the power of the Urus’ turbo V8 is more than the V12 of the LM002, but it’s the technology like all-wheel drive that allows it to really sink its teeth in, and sleek styling that pulls it all together. A super SUV like the Urus will blow your mind both with what it is capable of and just how good you look on the journey. The M5 has always been the standard bearer among the BMW line, with the larger 7-series being more pure luxury and the 3-series a bit more on the playful side. To be an M5, it must do everything right. Comfort that makes you never want to leave the seat, power that ensures you own the road, and handling that is part super saloon and part ultimate sports car. The newest M5 ticks all those boxes and more, including all-wheel drive, an M5 first. Compare it against previous generations and you’ll see the results of years of evolution of the ultimate driving machine. If you are going to talk the talk, you better walk the walk and the Ram Rebel TRX treads all over everything in its class. Throughout this concept vehicle you find features that would usually show up in specialty builds, including thirteen inches of suspension travel front and rear, 37-inch tires, and a detuned Hellcat motor that delivers more than enough grunt to break all four tires loose. The fun doesn’t stop there. The Rebel TRX features bulging fenders, a huge hood scoop, and enough lighting to scare off a herd of sheep from a mile away. Now you can have straight from the factory what used to take a pile of aftermarket parts to build. Sometimes “bought” not “built” is ok, and the Rebel TRX is proof. This is the car that made Koenigsegg what it is today. Outside the prototype, the CC8S was the first car Christian Von Koenigsegg created. It was also the first to sport the amazing dihedral-synchro helix actuation doors, and only six CC8S models were built between 2002 and 2004. The CC8S chassis, suspension, brakes and many components are all bespoke. The powertrain is a heavily massaged and re-engineered 4.7-liter Ford V-8 with twin-superchargers making 655 horsepower to the rear wheels. This is where the legend began, and given this anything-but-humble beginning, it’s no wonder that Koenigsegg has gone on to create some of the most amazing cars in the world. 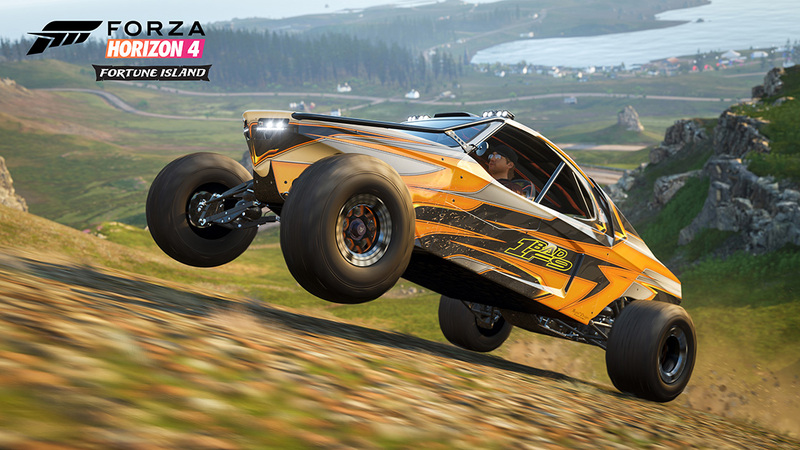 You might think that the folks at Exomotive built the Exocet Off-Road kit just for a world like Forza Horizon 4. After all, the Exocet Off-Road is purpose-built for taking on whatever you throw at it, devouring it, and leaving others in its wake. However, in real life, the Exocet Off-Road takes the heart of the nimble and ultimately friendly Mazda Miata and turns it into a beast that will haunt your driving dreams. It’s not a buggy but with its oversize tires and steel tube chassis, it’s just as capable. There is horsepower galore and the kind of fun that is only found in a vehicle as unique as this kit car creation. Asked to create something spectacular for the 2012 Geneva Motor Show, Filippo Perini came up with this concept car-turned-one-off-masterpiece over a weekend. The car was put together over just six weeks. At the J’s heart is the Aventador’s 6.5-liter V12; outside little remains the same. This is a pure open-air thrill machine, with no roof, no windscreen, an few amenities. There was only one made of this concept in the real world, and it was sold to a lucky owner who took it home after the show. In the world of Forza, anyone can experience this gorgeous car that is all about melting faces and collecting checkered flags. Saleen’s S7 model became something unique: an American supercar. The S5S Raptor is more civilized, but that doesn’t mean it is any less than what you would expect from Saleen. It has all the ingredients that make up a proper supercar: 0-60 in around three seconds, a top speed of over 200 mph, and even a few creature comforts. Underneath you will find a supercharged 5.0-liter V8, and twin wishbone control arms on each corner. This Raptor, which never actually made it into production, is a bird that will hunt down even the most elusive prey while delighting the eyes and ears with its sound and motion. It’s not how fast you get there, it’s how much fun you are having along the way. That’s how one must look at the ride from behind the wheel of this Morris Minor Estate. Somewhat reminiscent of a chopped, channeled, narrowed, and shortened Ford Woody of the same era, the Series II Traveler featured a tiny four-banger. No doubt, you will find the Traveler to be an outstanding piece of machinery, so long as getting anywhere fast isn’t one of your needs. Tiny and efficient, made of wood, and with all of around 30 horsepower, it will quickly find a place in your heart, or maybe even a route between that thick patch of trees that nothing else could conquer. To call it a buggy does not do it justice; in fact it would be wrong. This is a sandcar, built by a family that has been building “some of the baddest sandcars on the planet.” Ever since Gil George built his first sandcar in 1968 people have been asking to buy them. Among the field of Funco builds, the F9 stands atop them all. We are talking about a vehicle that will bust standing wheelies, in the sand, from 60-100 mph. To do that takes massive horsepower, and a high boost twin-turbo LS motor out back, making an outrageous 1,750 ponies does the trick. 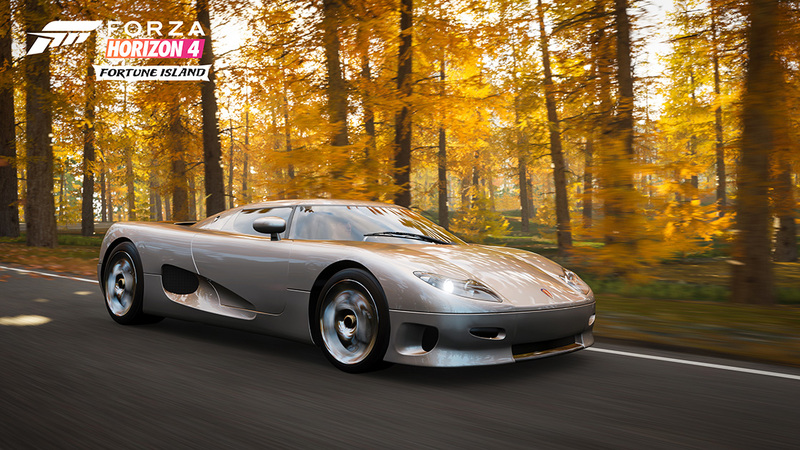 Making it the most powerful vehicle to come to Forza yet. Of course it’s not just massive power, it’s the ultimate chassis, suspension, and driver focused amenities. Take this beast for a ride and it will quickly become apparent where the “Fun” in Funco comes from. This is Ken Block’s Global Rallycross car, developed by M-Sport. The RX43 was featured in both Gymkhana Six and Eight -- who could forget the mighty donuts he spun around the Ford Raptor two-wheeling, or how the RX43 destroyed a field of ultimate supercars off the line in Dubai? Thankfully, in the game, you can disregard that “Do not attempt to recreate any of the activities performed” statement that bogs down real life. After all, this is Forza! Hoon responsibly! 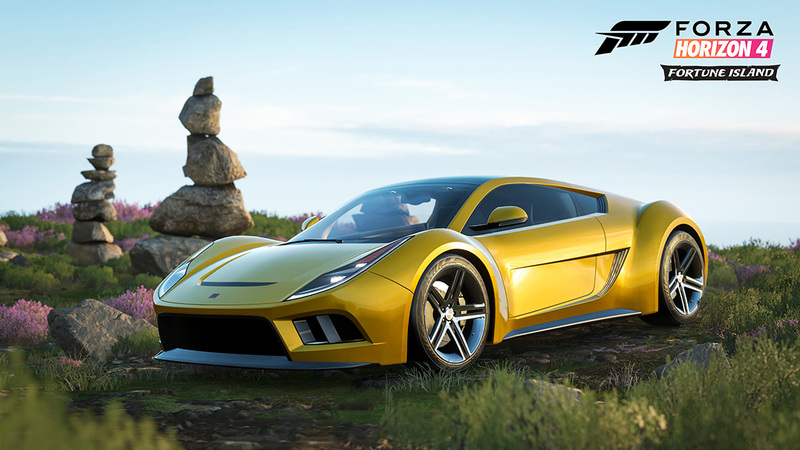 For more information on Fortune Island, check out the Fortune Island livestream direct from Playground Games HQ on December 13 starting at 7 a.m. Pacific. 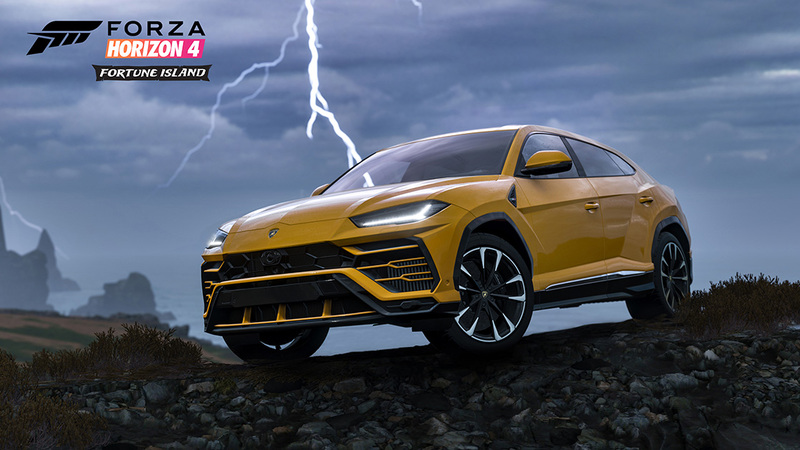 The PG team will be taking viewers for an in-depth tour of the island so tune in to the official Forza Mixer and Twitch channels to catch al of the action live!